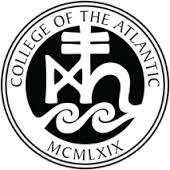 College of the Atlantic is a small, liberal arts college on Mount Desert Island, off the coast of Maine. Founded in 1969, COA offers all students a shared focus: human ecology. How that focus is directed is up to each student. Whether observing whales from the college's research vessel, pursuing an independent photo-journalism project in the Yucatan, studying international treaties, converting a campus building to solar power, or volunteering on one of COA's organic farms, students at COA learn from experience both inside and outside the classroom.